Welcome to ShopWildThings' selection of high-quality, beautiful bamboo curtains. This kind of beaded curtain is generally made by attaching multiple thin tubes of bamboo together with very thin wire. This laid back version of the beaded curtain is perfect for a beach cottage or anyone looking to bring any kind of laid-back naturalism to their surrounding Decorations. ShopWildThings Beaded Curtains use Lead-Free paints and stains. Not only are bamboo curtains popular among those lucky enough to live out their days in beachfront property, but they are also a go-to for set designers as well. We've sold bamboo curtains to Baz Luhrman for use on his set of the film Australia, as well as HBO to be used on the set of Big Love and at the Fockers' house in Meet the Fockers. Hanging Wooden Door Beads and Shell & Capiz Curtains are also popular room divider and wall Decor choices for us natural materials lovers! Our styles vary from plain to painted, with the painted varieties featuring anything from floral to psychedelic designs. We also offer tiki, animal and ocean themes. They can serve as a doorway or as a large wall Decoration — whichever fits your needs. Since our bamboo curtains are made with the beads incredibly close together, they do a good job of obstructing the view on the other side. However, it does not provide 100 percent obstruction. If you're leaning toward a painted bamboo curtain, you will be able to see the painting on both sides (though not completely). If the painted bamboo curtain is in a room where there is a lot of light coming through, the image will be more difficult to decipher until the lights are dimmed. ShopWildThings offers more than 40 Styles of Bamboo Painted Beaded Curtains. 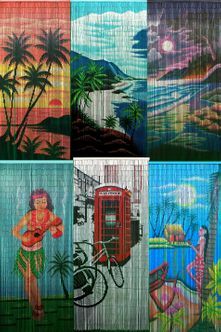 Before ShopWildThings started selling bamboo curtains in 2001, we looked everywhere for the very best we could find. That is what we offer today. They are hand-made, hand-painted and we believe exquisitely crafted. Because they are hand-made, variations in light and color can occur ; making each one an original piece!